Mary considers herself to be a good manager. Whenever one of her employee’s is struggling with an assignment she swoops in to help them put things into order and give pointers. Her company is now introducing a new 360-degree performance management system based on continuous feedback and, as a manager, she’s been encouraged to lead the transition by asking for feedback from her team first. She’s excited about this new change because she thinks it’ll help a few of her team members to open up more and resolve conflicts amongst each other. However, when she receives her feedback, she’s surprised to find that several people said she needed to let go more and allow people to work out assignments in their own way. One person even used the term micromanaging. Even though she’s supposed to be setting an example, her first reaction is to get angry. She sets aside a lot of time to help her employees solve problems and only gets criticism in return. She’s now supposed to act on the feedback she receives in order to encourage employees to do the same, but she’s still feeling betrayed. Most people have difficulty receiving feedback well. For others, the only thing worse than receiving constructive feedback is giving it. When given correctly, feedback is not meant to harm or criticize people, but meant as a way to improve. Even if we know feedback is good for us, what’s holding you back from accepting and sharing it with others? The answers might all be in your head. What makes us afraid of feedback? The most common answer is our body’s natural negativity bias. Prominent psychologists and neurobiologists have found that our brains are hardwired to react to negative stimuli faster. This was originally necessary for our survival. Sensing an attack would trigger our body’s natural fight or flight mode, increasing the amount of hormones released to the bloodstream, quickening reaction time and heightening our emotions. The experiences that trigger these reactions become etched in our brain so we can react to dangerous situations faster. This is why we tend to remember negative experiences more than positive ones. However, in an office setting our negativity bias and fight or flight reaction can actually work against us. Even when receiving mostly positive feedback, it tends to be the negative feedback that we recall most acutely. Though feedback doesn’t constitute a physical attack, in their separate research psychologist Peter Gray and management professor Neal Ashkanasy both explain that criticism can signal a sense of exclusion. In hunter-gatherer societies people were dependent on the group for survival. For this reason, constructive feedback can sometimes trigger our fear of exclusion from the group. Is fear of giving feedback more about yourself? In fact, this is also relevant to giving feedback. A study by Dr. Carla Jefferies of the University of Southern Queensland discovered that a failure to give constructive feedback may actually be more about protecting ourselves than others. In her experiment, participants were told to give feedback on an essay either face-to-face, anonymously, or to give feedback that would not be shared with the author. Supporting this research, a study conducted by leadership development consultancy Zenger/Folkman found that 74% of employees who received negative feedback already knew there was a problem. This shows that employees aren’t necessarily blind to what needs improvement; they just either aren’t sure how to improve or aren’t fully aware of their impact on the rest of the team. In fact, in previous research, the consultancy found that a majority of employees actually want constructive feedback. However, the caveat is that people don’t want to receive top down instructions on what to do. 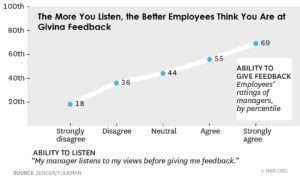 In the study, the Zenger/Folkman researchers found that the more managers listened to an employee’s point of view, the more honest and trustworthy the employee considered their feedback. Jack Zenger and Joseph Folkman suggest that the best way to give constructive feedback is to first give the other person the chance to explain the situation and what they think went wrong. Then allow them to formulate their own plan of action. If you listen carefully up to this point, when you give your own feedback, it is much more likely to be well received. Finally, offer to check in the following week so that you can lend further advice if needed, without seeming overbearing. For more information on how to give constructive feedback see here. So what are we still afraid of? Stanford Professor Carol Dweck’s studies into what she terms ‘fixed and growth mindsets’ also provide valuable insights into this fear. According to her research, people with fixed mindsets view their skills as constant personal traits, while people with growth mindsets view their skills as malleable abilities which can be improved. For example, children who have been praised for being smart throughout their lives may face difficulties improving after receiving a bad grade on an exam. However, children who have been praised for getting good grades based on their hard work and dedication are more likely to see a bad grade as an opportunity to learn more. When we associate abilities with a part of our identity, receiving constructive criticism can feel more like a personal attack. People with growth mindsets, on the other hand, are more likely to take risks and overcome obstacles by seeing failure as a signal to try harder, rather than time to give up. When you start placing blame on others for the feedback you receive, this is your fixed mindset speaking. Once you recognize this voice you can begin counteracting it and responding with a growth mindset. Matias Rodsevich works in PR & Communications at Impraise, a web-based and mobile solution for actionable, timely feedback at work. Impraise is an employee performance management software that allows talents to learn and develop every day. Matias holds a Bachelor in Public Relations from UADE, he did part of his studies at Griffith University, Australia. With more than 3 years of work experience in PR firms working for international clients such as IBM and Google, he continues working in the PR field currently as a PR manager for Impraise.